CAST is one of Positive Marketing’s longest-standing clients. Over the years Positive has delivered a variety of services – events, content, research and PR. The main objective was to increase visibility of CAST among its key influencers and target markets. However, towards the end of 2017 we faced an additional challenge. CAST recognised a need to establish a new message. CAST was mostly known for software code quality analysis. The trouble was that ‘code quality’ is dominated by free open source tools and it’s only a part of what CAST offers. It needed to redefine itself to encompass all its solutions, which is where Software Intelligence comes in. Software Intelligence – CAST’s new category name – comprises of four main things: structural software risk analysis, code quality, productivity measurement and architectural blueprinting of systems. To address the first issue of increasing visibility and generating press awareness, Positive used CAST’s independent research to reach target sectors, especially the financial sector. A vigilant watch on the news for any relevant, major stories meant CAST could quickly respond. Positive also leveraged executive visits to London to secure interviews. As for CAST’s messaging issue, Positive advised CAST to re-categorise. We treated Software Intelligence as a category, not a campaign, and weaved various campaigns into this new category. Positive adopted a ‘Strike’ strategy, an integrated marketing push, to position the company as the global Thought Leader on Software Intelligence. Positive created and led an independent research centred on Software Intelligence. 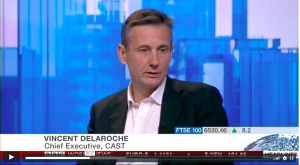 In addition, Positive suggested and helped organise CAST’s category launch of Software Intelligence as part of its annual Sales Kick Off event in Paris, inviting key tech journalists to attend. 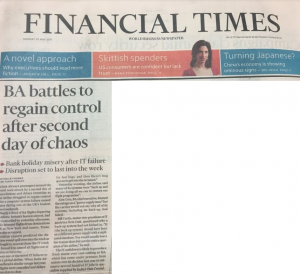 Positive’s rapid response to British Airways’ IT glitch resulted in an interview with BBC Radio 5 Live and getting CAST on the front page of the Financial Times, with an additional two pieces in the FT featuring CAST’s comments. 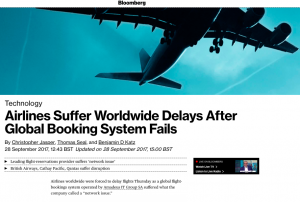 An additional IT system failure in the aviation sector later in the year presented another opportunity, resulting in coverage in Bloomberg. When news came out of Equifax’s data breach, Positive worked closely with CAST to quickly establish a point of view by writing an open letter and closely monitored the news for the ‘next bounce of the ball’. Our instincts were right. The CEO resigned and we immediately sent proactive pitches to the press resulting in coverage in Computer Weekly, Computer Business Review and SC Magazine. Pitching CAST’s CRASH Report and Developer Survey, simplifying the research and presenting the “real-world”, business value of the findings, coverage was attained in The Times, Sky News, UKTN and an interview with The Register. Along with securing coverage with national and key tech press, Positive reached out to the fintech press, achieving coverage in Fintech Finance, bobsguide, Finextra and Global Banking and Business Review, among others. When CAST’s CEO came to London, Positive arranged interviews with BBC Talking Business and IDG. Journalists who attended CAST’s category launch gained a better understanding of Software Intelligence, especially through hearing testimonials. To communicate this category throughout 2018, Positive continued reaching out to press with expert comments and research, explaining Software Intelligence. The results speak for themselves. The TSB IT outage resulted in CAST’s comments featured in BBC News, The Telegraph and again in The Telegraph; the Visa outage in BBC News and Forbes; and the London Stock Exchange glitch in The Telegraph, Sky News, BBC News and The Times.